Tag line: "TERROR...IN THE DEPTHS OF STRANGE EMOTION!" Trivia: This film is cited by Stephen Sondheim as inspiration for writing "Sweeney Todd"
Having already teamed up for 1944’s The Lodger, director John Brahm and star Laird Cregar joined forces once again in 1945 for Hangover Street, a brilliant psychological thriller about a classical composer in turn-of-the-century London who suffers from bouts of amnesia. But it’s what he does during these lapses in his memory that’s caused Scotland Yard to sit up and take notice. Encouraged by his neighbor Barbara Chapman (Faye Marlowe), musician George Henry Bone (Cregar) has been working on a new symphony, one that’s sure to be his masterpiece. But George also has a rare condition that strikes from time to time, causing him to wander about in a trance-like state, sometimes for hours, after which he remembers nothing of what transpired. His latest incident lasted for an entire day, leaving George to wonder if he was the party responsible for a murder committed in a nearby neighborhood. Frightened and confused, he visits Dr. Middleton (George Sanders) of Scotland Yard, who, after looking into the matter, says there’s no evidence to suggest George is a killer. During an evening at a local dance hall, George is introduced to singer Netta Longdon (Linda Darnell), for whom he writes a song. To Netta’s surprise, this song proves popular enough to earn her some much-needed cash. Hoping to convince him to continue writing for her, the manipulative Netta cozies up to George, pretending to be in love with him. Before long, George proposes to Netta, only to discover she’s already engaged to promoter Eddie Carstairs (Glenn Langan). This realization is too much for him to handle, and George slips into another of his trances. The next day, the newspaper headlines scream that Netta is missing, and presumed murdered. Did George have anything to do with Netta’s disappearance, and if so, why can’t he remember it? Hangover Square is a tense motion picture, with director Brahm pulling out all the stops to tell the story in a visually spectacular manner. In the film’s opening scene, we witness the murder of a shop owner from the killer’s perspective, watching as the man, who struggles to break free, is stabbed repeatedly. A later sequence, which takes place on Guy Fawkes Day, is equally as impressive, following a character as he carries a corpse, dressed to resemble Guy Fawkes, through the streets of London before tossing his victim into a bonfire. Even the film’s finale, during which the camera move freely around the room as Stone’s symphony is being performed, succeeds in building a great deal of tension, leading to a climax as dramatic as anything that went before it. 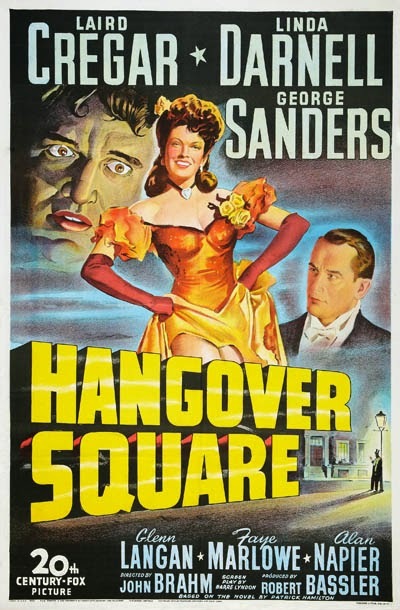 Along with Brahm’s striking visual style, Hangover Square features a tremendous performance by Laird Cregar, who expertly conveys his character’s inner turmoil, often doing so without the use of dialogue. Tragically, this would be Cregar’s final film; he died of a heart attack in December of 1944 at the age of 31, two months before the premiere of Hangover Square. In both his films with John Brahm, The Lodger and Hangover Square, Cregar proved himself an actor of immense talent, leaving us to ponder what else he might have accomplished had he lived a full life. To many film enthusiasts, the names John Brahm and Laird Cregar won’t mean anything. If that’s the case, do yourself a favor and watch both The Lodger and Hangover Square immediately. Odds are they’ll make as strong an impression on you as they did on me. Yes! More people need to know about Laird Cregar and his short but brilliant career. Glad to see you post about his final film and praise it so enthusiastically. Hope it will help people find it and the actor, too. Cregar was a sad character. A brilliant actor, he died before he could establish himself within the canon of the best film actors of his day. I've heard it said that his health was largely wrecked by the constant struggles he waged with his tendency to be overweight. He portrayed one of my favorite versions of Satan in the Don Ameche film, HEAVEN CAN WAIT (not to be confused with the much later Warren Beatty film re-imagining WAITING FOR MR. JORDAN).